C2 has developed C2Assess, a complete and robust survey tool-set. 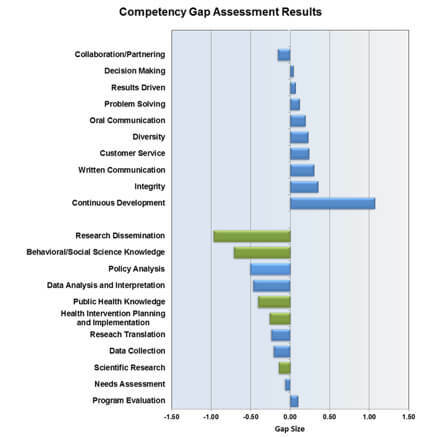 The C2Skill Gap Survey provides insight into the proficiency level of an organization’s entire workforce. Organizations select skills and set desired proficiency levels for different positions. The C2Skill Gap Survey then pairs individual proficiency self-ratings and supervisor proficiency ratings on each skill to provide a more complete, unbiased picture of the full workforce’s current skill level. These results are analyzed against the desired proficiencies set by the organization to identify skill surpluses and skills gaps. Selecting areas for training or hiring needs becomes as simple as looking at one of the C2Skill Gap Survey’s reports. Our Skill Gap Survey provides employees with tools to build out, and maintain their own content. C2Assess surveys are also Section-508 compliant. The right tool at the right place at the right time.